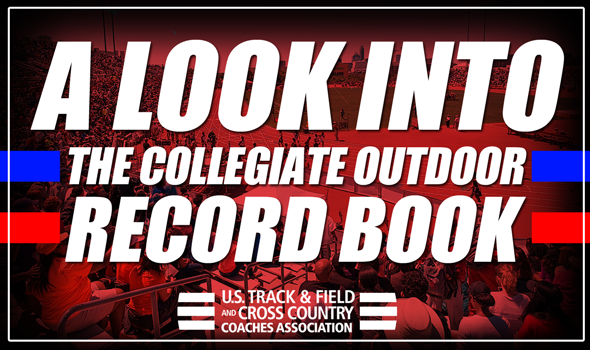 You don’t have to look much further than the ever-changing collegiate outdoor record book to understand that fact. Over the past two seasons, 16 of the 42 current all-time bests have been established. That’s 38.1 percent of them! Yet as much as the collegiate outdoor record book has changed, some marks have stood the test of time. As of right now, there are 14 all-time bests that were set more than 20 years ago, including three that are now 40 years old. There is reason to believe, that based on what we saw out of three male athletes during the indoor season, that three of these older records could fall in 2019. The first of which is Renaldo Nehemiah’s 40-year-old standard of 13.00 in the 110H, which was a world record at the time. Grant Holloway is the biggest threat to this mark as he sits No. 2 on the all-time chart at 13.15. Holloway smashed the American and collegiate record in the 60H at the NCAA Indoor Championships earlier this month when he crossed the finish line in 7.36. There is little reason to doubt that Holloway’s new-found speed will translate well outdoors. Next up is John Godina’s 24-year-old standard of 22.00m (72-2¼) in the shot put. Godina recorded that mark at the 1995 NCAA Division I Outdoor Championships. By the end of the season, Payton Otterdahl might just topple that pillar. Otterdahl broke the collegiate indoor record in the event with his heave of 21.81m (71-6½), so he could very well add some distance outdoors as the weather gets warmer. Finally we have Lawrence Johnson’s 23-year-old standard of 5.98m (19-7½) in the pole vault. Mondo Duplantis already broke the collegiate indoor record in the event when he cleared 5.92m (19-5) at the SEC Championships and owns a lifetime outdoor PR of 6.05m (19-10¼). Chances are it’s just a matter of time until the LSU freshman phenom unifies the pole vault records. As far as those four women’s records, listed in the above chart, chances are they remain unscathed, because very few have come close over the years. The only woman within eight feet of Meg Ritche’s discus record was Suzy Powell in 1997. Only two women have come within three inches of Jackie Joyner-Kersee’s long jump record in the past 34 years: Sheila Echols in 1987 and Brittney Reese in 2008. No woman in the past 30 years has gone sub-10.91 in the 100 other than Aleia Hobbs, who accomplished the feat twice. The closest any woman got to Diane Guthre’s 6527-point standard in the heptathlon was Brianne Theisen in 2012 with her 6440-point total. We’re bound to see some collegiate records broken this outdoor season. Now it’s time to sit back and see who does it.